Discovery of the Beckhampton Avenue at Avebury? In ‘Without Knowing Mr. Walkley’ (Faber & Faber), published in 1939, Edith Olivier recounts an extraordinary experience she had on her first visit to Avebury in 1916. I haven’t seen it quoted or referred to anywhere else, perhaps the book itself had a limited run, appealing, as it probably did, to a limited readership. It concerns the lost Beckhampton Avenue. Later in the chapter this is how she describes her experience; “And now comes my own experience, as impersonal as any; and so unlike the ordinary ghost story that it was years before I knew that it contained any element of the supernatural. “It was a dark October evening during the war, when I was superintending the Wiltshire Women’s Land Army. In those unhappy years, my work was of all others the least unhappy, for it took me, not to scenes of pain in hospitals, nor yet to hear the endless whir of machinery in factories, but instead, to peaceful farms, where girls milked cows, or ploughed the fields, or harvested the crops. In those years I learnt my way about every part of Wiltshire, much of which had hitherto been unknown to me. That evening I asked my way from Devizes to Swindon and then drove on alone in my own small two-seater car. It was between five and six, and a wet, dreary night. “After a few miles I left the main road, and then I entered a very strange avenue. I was passing through a succession of huge grey monoliths, which stood on either hand, looming like vast immovable shadows within a curtain of softly falling rain. At once I knew where I must be, I was evidently approaching Avebury, that great prehistoric monument, older perhaps than Stonehenge and with a far more complicated plan. 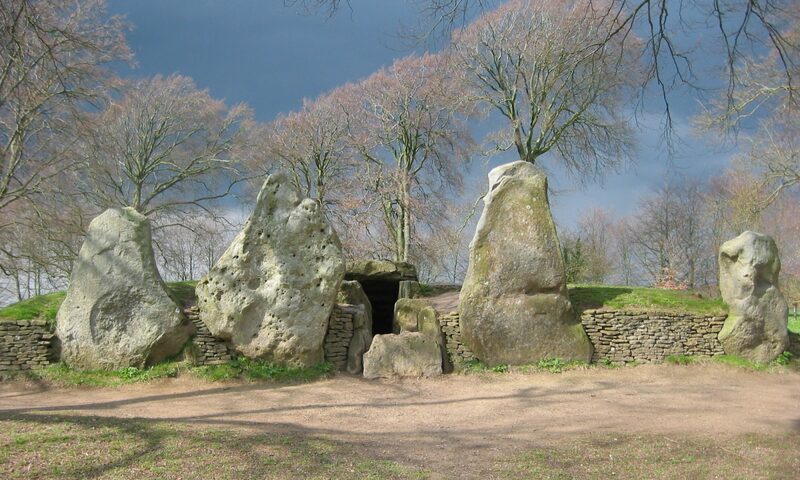 This part of Wiltshire was at that time quite unknown to me, but I had often seen pictures of Avebury in archaeological books. “Like Stonehenge, Avebury was originally a circular megalithic temple, but unlike it, it was approached by stone avenues, extending in some instances for over a mile. In the old days, this must have added immensely to the impression created by the place; and now, coming upon it unexpectedly for the first time, I immediately felt its grandeur, and was dominated, even at some distance away, by the sense that I was nearing an ancient and a very wonderful place. By now it was raining hard, but I told myself that wet or fine I must certainly get out of the car when I reached Avebury for nothing would induce me to miss this first opportunity of seeing it. “At the end of the avenue, I reached the great earth-work which surrounds the temple and I climbed on to the bank. There, beneath me, I saw the huge stones, not standing more or less undisturbed in their lonely circle as they do at Stonehenge, but far fewer in number than they once had been, standing or fallen in irregular formation, with cottages built among them interrupting the ancient plan. This didn’t surprise me for I already knew that the village of Avebury was built actually within the old circle, its cottages standing rather incongruously among the megaliths, from fragments of which they were built. “This might be expected to spoil the effect of grandeur which Avebury should give; but on that particular night a village fair happened to be in progress. Although it was true that houses and people did take from Avebury that peculiar mystery which Stonehenge gains from its loneliness on the downs, yet I now saw that during the centuries, Avebury had gathered a new romantic character. The temple and the cottages possessed a unity, for the houses have not only grown up among the stones, they are of the stones. The vandalism which long ago hewed up the megaliths and made from them little houses for farm labourers to dwell in with their families, has succeeded in blending the one with the other. The old stones of Avebury are humanised as Stonehenge never will be. “And the fair that night brought out this aspect of the place. It looked right. The grand megaliths and the humble cottages alike were partly obscured by the failing light and the falling rain, but both were fitfully lit by flares and torches from booths and shows. Some rather primitive swing-boats flew in and out of this dim circle of light; coconuts rolled hairily from the sticks on which they had been planted; bottles were shivered by gun-shots and tinkled as they fell to the ground. And all the time the little casual crowd of villagers strayed with true Wiltshire indifference from one sight to another, those great stones, the legacy of architects of an unknown race, had succeeded in adapting themselves completely to the village of another day. I stood on the bank for a short time watching the scene; and then I decided that too much rain was falling down the back of my neck, so I got into the car and drove away. “Then she read me that a fair had formerly been held every year at Avebury, but that it had been abolished in 1850. “So long had passed since the night I saw the fair, and so absolutely normal had it then appeared to me, that now I found great difficulty in answering the questions that at once occurred to my mind. How, for instance, had the people been dressed? As far as I could remember, very much as country people still did dress at the time I was seeing them. An impression remained of browns and other dark, rather dull colours – of clothes which toned with the rainy night. Then again, had I heard the noise of the fair, or had I only seen it? I thought I remembered voices and music and rifle-shots and the clicking of balls against coconuts, but how far away from me had those sounds seemed to be? I supposed that they must have sounded quite normally near, or I should have felt that I was seeing something uncanny. This I had certainly not felt at the time. “But now there seemed to be no doubt that in October 1916 I had watched a scene which must have taken place at least sixty-six years earlier. “So not only the fair but the whole of my experience that night from the time I left the village of Beckhampton a mile away, had taken me back to some time in the eighteenth century. I must have stepped back in time, as did Miss Moberly and her friend at Trianon, who in 1901, walked on paths , crossed bridges, and saw cascades, which had ceased to exist a hundred years earlier. “This is what I was trying to suggest in what I wrote above about Salisbury Plain. Here, if anywhere, one feels as if one had been taken up into that ‘universal common-to-all mind’. It is not a question of ‘seeing ghosts’ or of ‘having visions’; it is that sometimes, under the influence of that great spirit that seems ever brooding over the Plain, one’s own little outlook is lost, and one is incorporated into something older and bigger and wiser than oneself. One knows what the past was like. “Of course I wanted to know whether or not that avenue ever did exist. Traditionally, as I have said, Avebury was approached by more than one avenue; but of the Beckhampton one, by which I must have come that evening, there exists today no trace. “It was therefore with immense interest that I heard, a year or two ago, that the avenue was being excavated, that many of the megaliths had been found lying buried where they had fallen, and that these were being set up again in their original positions. I went to Avebury to see the work in progress. “Great was my disappointment to find that the avenue which had been replaced was not where I had seen it. Instead of going West from the temple, it ran South. For a few minutes, I felt that I must wipe out my memory of that night in October 1916. Then I sat down to hear a lecture given by Mr. Keiller, the excavator.